Christmas isn’t here yet, but I’m already craving cookies like crazy. 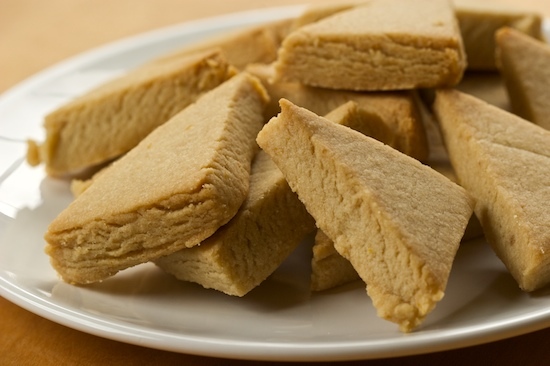 This morning I was looking through different cookie recipes I’ve posted in the past and I ran across this recipe for Brown Sugar Shortbread that was hidden in a post about Lemon Shortbread from a few years back. Since these cookies are so delicious, I decided it was time to give them their own space to shine. Keep in mind that a batch of shortbread packaged in a cute box or tin makes a wonderful gift! Cream butter and sugar in a large bowl. By hand, stir in flour a little at a time. Dough will be crumbly, so dump it out onto a counter top or pastry board and work it together by hand until smooth. Pat or roll dough out into a rectangle that is about 1/2 inch thick. Cut into small squares, rectangles or diamonds (whichever you prefer). Arrange cookies on an ungreased baking sheet (I use parchment paper for easy cleanup) and bake 20-25 minutes in a preheated 325 degree oven until the bottom edges are just starting to brown. Recipe notes: This recipe assumes you are using regular salted butter. If you choose to use unsalted butter, whisk 1/2 teaspoon salt (or slightly more if using kosher salt) into the flour before mixing the dough. These are so beautiful and would be great as a gift! Have a great day! They really lookd delicious!!! I could eat them all! Approx. how many cookies will this yield? These look so good! I don't think I've ever made a shortbread with brown sugar--super excited to try it out! I just made these. They are fantastic! Thank you so much for sharing. Lately I've eaten an awful lot of shortbread with apple butter, and I have an unholy love of brown sugar, so I think that you've just introduced me to an even better combination. I can't wait! These looks delicious, and so easy! Can't wait to try them. I saw a recipe a few weeks ago for shortbread made with apple butter. Now, I can't find it anywhere! Any idea what I'm talking about? I just made these and they are very good. I made them in my Kitchen Aid stand mixer so was super easy. I think I now prefer shortbread with brown sugar rather than icing sugar.Thanks for a great recipe that is also easy. Three ingredients and one of them is brown sugar? Love it! These look fabulous. Happy holidays, Nicole! These look absolutely mouth-watering. I'll bet they smell so good when they're baking. I'm going to try them in the morning. Thank you for the recipe and have a Happy New Year! Totally awesome. Butter and sugar...two of the main food groups! I plan to try these soon. OMG! Can this get any simpler? I was searching for a sweet treat to give my little one and this one came up. Will make some changes and get back with the results. Thanks for this. I want to make this more kid friendly. Can i add a little vanilla essence to take the harshness off the brown sugar? Cracking recipe! I made these for christmas, and they vanished within minutes. Thanks for sharing! I really love this recipe. just looking at the picture make you wanna eat them. I'm not a person who makes foods from scratch but I will certainly give this one a try. Bread without the refined sugar! always the best choice if we consider our wellness..! My vote is for brown sugar!